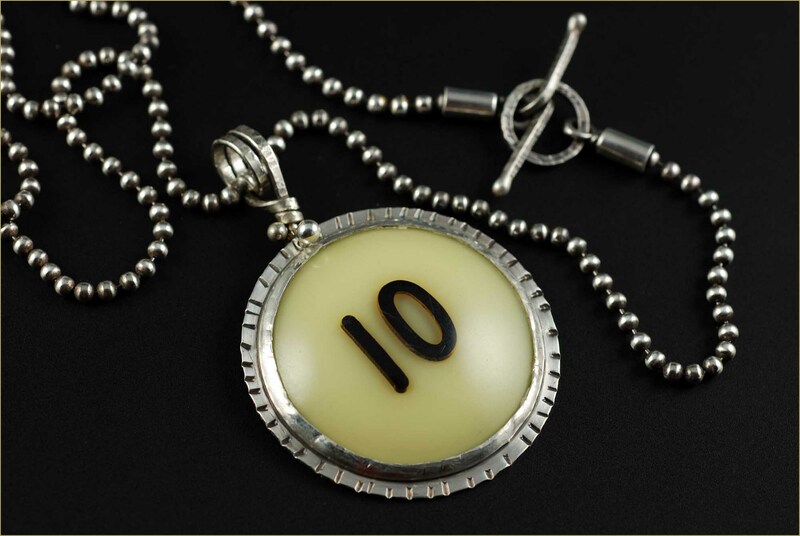 “Ten” Pendant – This fun double-sided pendant made of sterling silver is quite novel – the textured bezel holds a slice from a cue ball! The textured backside of the pendant is stamped with text that reads “Number – a mathematical unit used to express an amount”. This piece is one and one-half inches in diameter and hangs on a 25″ sterling silver ball chain. $268. “Pearl of the Orient” – Another interesting reversible mixed media pendant with different colorways on each side, this piece has an Asian theme. On one side in pastel tones, the sterling silver bezel holds a fragment of a postcard from Japan along with Japanese text and a butterfly wing captured in resin. The brighter colored backside shows the portrait of a Geisha framed in the textured bezel. A large cream colored pearl dangles at the bottom. The piece glides along a hand-hammered bronze neckring. It’s like having two pendant! Sold.